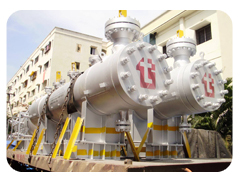 Waste Heat Recovery Systems are supplied for catalytic cracking plants for the production of Ammonia, Methanol, Town Gas and Hydrogen. 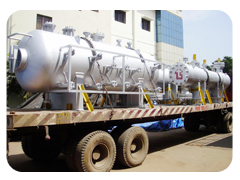 They utilize the fuel gas heat from the furnace heating and provide process gas cooling by means of Steam Generation and preheating of the medium used as well as of the feed and process water. 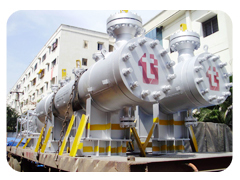 Process Gas Boiler is installed behind Steam Reformer to cool high pressure – high temperature process gases thereby generating high pressure saturated steam. 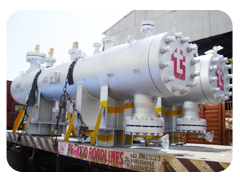 We use GAPFREE WELDING for tube to tube sheet joints to avoid CREVICE CORROSION and to have COOLED WELD JOINT. 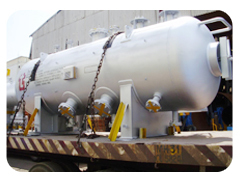 In addition we offer CONVECTIVE BANK to cool the flue gasses from the Reformer to preheat feedstock, fuel gas, steam, combustion air, etc. 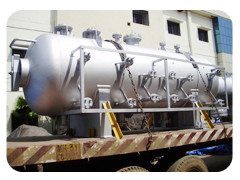 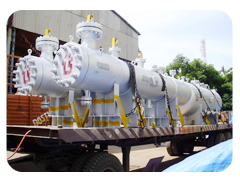 Hydrogen, Methanol, Ammonia Process Gas Boiler Convective Bank.